A game where contestants play a version of Russian roulette, except bullets are replaced with electric shocks, could be making its way to America. The idea comes from former mixed martial arts fighter Valeriy Eschenko. The Russian retired from MMA due to a nerve condition called Guillain–Barré syndrome which put him in a coma from which he emerged paralyzed. 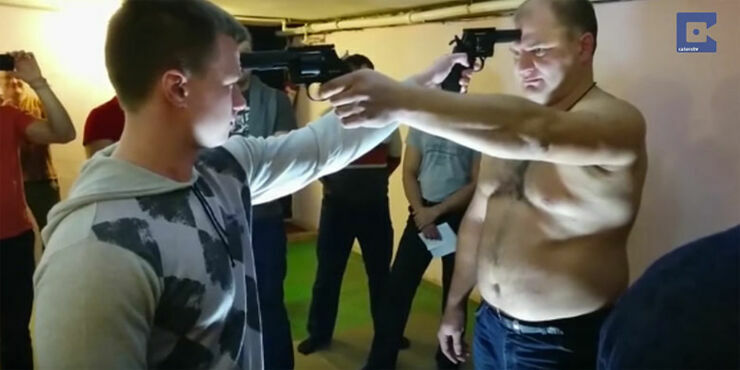 While he was in hospital recovering he thought up the idea for his taser Russian roulette. He set about patenting it, got the guns made which emit a painful electric shock, and launched the game when he got out. It has now taken off in Perm, Russia where he lives and other regions of the country too. The game, called New American Roulette, features different stages where the number of live rounds is increased each time, this happens until the contestants are whittled down until there's a winner, the last person left. The winner receives prize money. And now, it seems, it might be coming to America too. Eschenko filmed people playing it in San Francisco after a buyer from Las Vegas was interested. "The game brings adrenaline and helps you to relax,” Eschenko says about its supposed benefits. “There have been no injuries and there won’t be any." Other reasons to play are the winnings, of course. "As well as the one-million-dollar proposed prize, currently there are always sponsors and they set great prizes from one to five thousand dollars. Spectators can bet money on the winner and in some regions, those who organise my game have grown rich." Whether it ever makes it over to the US, we'll have to wait and see.